A guest post by Gillian Carolan. Tribesmen Rowing Club from Galway in the west of Ireland travelled north in a party of 27 recreational rowers to spend the August bank holiday weekend tour rowing on the lower Bann River. 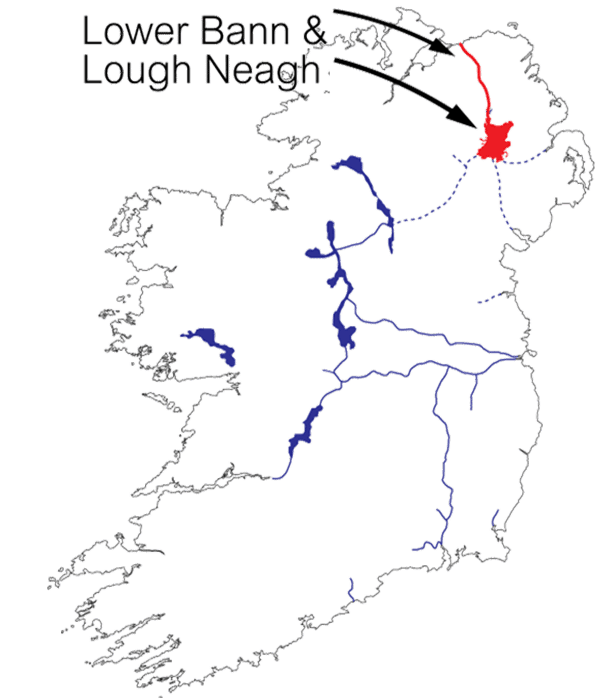 Over 2 days, we rowed some 60 kilometres from Toome in County Antrim, on the north-west shore of Lough Neagh, to Portstewart in County Derry, where the river reaches the sea. We followed this with a shorter optional tour on the River Lagan on Monday morning. We based ourselves for 3 nights in the wonderfully restored Old Flax Mill at Aghadowey, near our finish point, which accommodated all 27 of us in comfort and style and allowed us to self-cater. The restored Old Flax Mill at Aghadowey where all 27 of us stayed. Learning from the experience of club members who did a pilot trip several years ago, we pre-booked the services of a bus driver, Richard, who drove us to and fro with great commentary on local sights and history, thus both entertaining us whilst avoiding the logistical challenges of having many cars involved. The 5 Wintech tour boats were ably towed from Galway before daybreak by Mike Goonan of Cumann Ramhaiochta Cholaiste na Coiribe. Thanks also to our neighbours Grainne Mhaol Rowing Club and NUIG Boat Club for lending us a 5th boat. Local staff at the starting point at Toome slipway and coffee shop on Saturday morning were helpful and hospitable as we built our boats, and launched them, with very little wading required, along with our safety catamaran. We were surrounded by an equally helpful film crew preparing for a period drama starring Belfast’s own Jamie Dornan, whom we apparently rowed past as he sat in a currach close by, causing one wag to rechristen our tour “Fifty Blades of Neagh”. Safely launched in perfect conditions, and equipped with laminated navigation maps provided by Norma McCambridge (who did sterling work on a logistical reconnaissance mission), we headed north across Lough Beg at a leisurely pace, arriving at Portglenone Marina for our lunch break. One of the many benefits of tour rowing is the hatch at either end of the boat, allowing picnics to be stowed for such an occasion. From Portglenone Marina, we made it to our first lock at Portna. We had some amusing changeovers during the trip as we swapped coxes every half hour or so, following the practice we encountered on French tours over the years. Let’s just say the smaller the person, the easier the changeover, and leave it at that. Every 30 minutes we had a cox changeover. This stretch of the journey was pleasantly uneventful, bar the volleys of shots which suddenly disturbed our reverie and caused some concern, until we realised it was clay-pigeon shooting in a nearby field. The first boat through claimed to have been hit by shrapnel, but it was more likely pieces of flying clay. Certainly, the rate momentarily went higher than is advisable in tour rowing. The lock at Portna was a new experience for a few of the 25 rowers, and we improved our technique of filling the chamber efficiently as the weekend progressed. We were pleased to be able to fit all 5 boats and the catamaran in one go, thus saving considerable time for the tour, since each lock can take 45 minutes to an hour to traverse. Each lock can take 45-60 minutes to traverse, so fitting all boats in together saved time. It came as a bit of a surprise for some of us who hadn’t properly studied the navigation materials to discover that Portna is actually a double lock; just as we thought we were done and out, we were back into the second chamber for the same routine all over again. That said, the experience is enjoyable provided everyone relaxes and does what they are told – and locks do allow for a much needed rest and stretch! The lock-keepers we encountered along the route added hugely to the experience and the enjoyment, keeping up a non-stop banter which, for many, was incomprehensible due to their strong accents. Payment can be made at the first lock to cover all locks on the route. In our case this involved using a not terribly clean sock to transfer the funds from the descending chamber up to the lock-keeper on the stone wall, and reversing the procedure with the receipt. There must be a more dignified way; apparently it can be done online via Waterways Ireland. From Portna it was a short hop on to Kilrea and our end point for Day 1 at the slipway at Portneal Lodge (closed for refurbishment). Here again we met with kindness and hospitality from a contractor who allowed us to store our boats securely within a fenced compound overnight. Team work was well demonstrated at this juncture, with all hands on deck to lift and lug the boats into the gardens of the Lodge and tidily stow away oars, lifejackets and tillers out of sight. Kilrea proved to be almost our undoing, as it offered a very convivial local pub only a 10 minute walk away, where we waited for Richard and his bus. Bemused locals and publicans could only smile at the noise made by thirsty neon-lycra-clad, middle-aged rowers as we descended upon them like exotic birds, drank our pints and departed as fast. Sunday dawned fair and we launched from Kilrea in perfect conditions, heading north through more locks at Movanagher, Carnroe and the Cutts. After lunching at Drumaheglis Marina, we encountered the water-skiers we had been warned about on their designated stretch of the river. We may have been lucky but we were met with courtesy and consideration and no harm was done – just a little bit of wave-surfing in the strike position. We had timed our arrival at the Cutts, the last lock on the non-tidal stretch, to meet the full and turning tide, and thus benefit from an easier stretch up to the coast on the outgoing tide. We were welcomed at Bann Rowing Club, Coleraine, by captain Keith Leighton before heading on again through the town and under railway bridges to our final stop at the Crannagh Marina. At this juncture, three crews elected to pull in and start de-rigging. Two crews couldn’t resist the challenge of making it to the sea, given that the conditions were still perfect. Nobody was really sure how far away that might be (suffice to say it’s a lot shorter by road), but I can attest that we could smell it, if not actually see it, when we decided to turn alongside the sand dunes and row back against the tide to join the others and load the trailer ready for our tour on the River Lagan the following day. The obligatory swim for some on Portstewart Strand and a quick drink in Harry’s Shack finished the day before we were transported yet again back to our lodgings for our third and final night. The Bann River is an undiscovered gem. We met barely any traffic on it and encountered nothing but friendliness and hospitality along our route (gun-fire notwithstanding!). Done properly with sufficient planning, it is a safe tour for recreational rowers because the conditions are generally rowable and the river is mostly well-sheltered, although the distance may be challenging for the less fit or novice. Tribesmen Rowing Club has collated the details on whom to contact in advance (lock-keepers, Waterways Ireland, marina managers, bus companies), where to stay with a crowd, and how to approach the logistics. We are happy to share those details with any club considering the trip. Contact our secretary for more info. Next Post Rowing deep – no longer a drag?